Block? 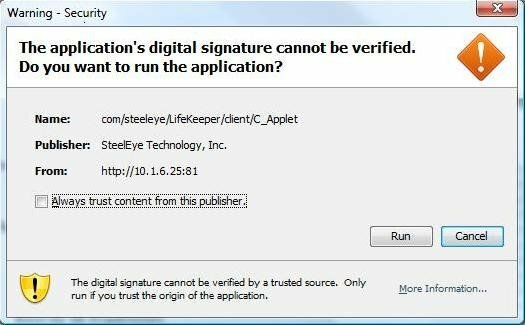 Enter “No” and the LifeKeeper GUI will be allowed to operate. Check the “Always trust content from this publisher” box and select “Run”. 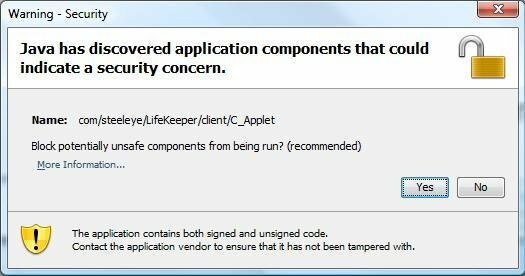 The next time the LifeKeeper GUI Java client is loaded, the warning message will not be displayed. Add the following entry to your Java “deployment.properties” file to eliminate the second dialog about blocking. The security warning will still be displayed when you load the Java client, however, the applet will not be blocked and the Block “Yes” or “No” dialog will not be displayed. Please note this setting will apply to all of your Java applets. To bypass both messages, implement 1 and 2.